Santa Clarita Valley: Hollywood's Back Lot. By Alan Pollack, M.D. | Heritage Junction Dispatch, Sept.-Oct. 2008. The Santa Clarita Valley played an important role in the birth of the movie industry in the early 20th Century. Due to its rugged scenery and proximity to Hollywood, the valley played host to many of the early Western movies with stars like Hoot Gibson, Tom Mix, Harey Carey, John Wayne and Newhall's most famous resident, William S. Hart. "Two Gun Bill" Hart was a silent movie actor known for his attention to realism in his Western film. His movie career lasted from 1914 to 1925, ending with the classic "Tumbleweeds." During his film career, Hart was the most famous actor on the planet. He purchased a ranch house in Newhall in 1921 and later, upon his retirement, built a hilltop mansion where he lived with his sister, Mary Ellen, until his death in 1946. Hart counted among his friends the legendary lawman Wyatt Earp and famed Western artist Charles Russell. In 1940, Hart built and financed the American Theater on Spruce Street in Newhall — the valley's first structure specifically built as a movie house. He willed his ranch to Los Angeles County to be used as a public park. Hart's later movie career was overshadowed by flashier Western stars such as Tom Mix. Mix filmed some of his movies in Newhall and established one of his early "Mixville" movie towns there. His most notable film in Newhall was "Three Jumps Ahead" (1923), in which he purportedly jumped the 90-foot-deep Beale's Cut on Tony the Wonder Horse. Mix's heroic jump was in reality performed by a stunt man using a ramp. 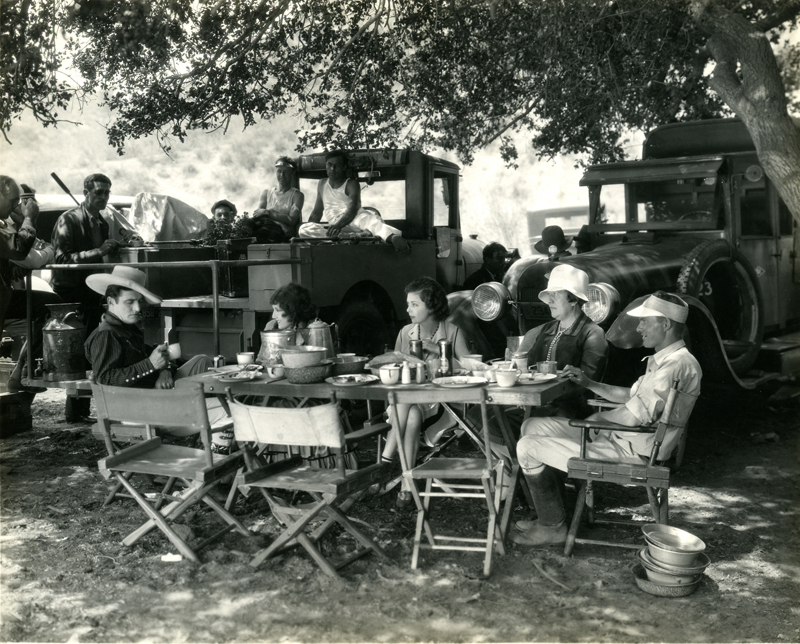 Beale's Cut also appeared in the 1939 John Ford-John Wayne classic, "Stagecoach." Hoot Gibson made movies in the valley, but was also known for his ownership of a rodeo arena in Saugus in the 1930s that later became the Saugus Speedway. A saddle he used in the rodeo in 1934 can be seen in the Historical Society museum at the Saugus Train Station. A number of film studios can be found throughout the SCV, the most famous of which are Melody Ranch and Disney's Golden Oak Ranch, both in Placerita Canyon. Trem Carr established a movie ranch for Monogram Pictures in the early 1930s in Placerita Canyon just east of present-day Highway 14 at a location that is today used by the Golden Oak Ranch. Ernie Hickson built a Western movie set for Carr. In 1936, Hickson purchased property in Placerita Canyon to the west of Carr's expiring leasehold and moved his entire set to the new Monogram Ranch. Upon Hickson's death in 1952, Gene Autry purchased the property and Melody Ranch was born. Countless Western movies and television shows - most notably "Gunsmoke" - have been filmed at the studio, and many famous actors walked the dusty streets and boardwalks of its Western movie sets. Sadly, Melody Ranch burned to the ground in the raging wildfires of 1962. The ranch was painstakingly resurrected by the Veluzat family in 1991 and became the home of the HBO series, "Deadwood," as well as the annual Santa Clarita Cowboy Festival. The future Saugus Speedway was built originally as a rodeo arena in 1927 by Roy Baker, brother of shoe magnate C.H. Baker. Baker Ranch Stadium was a completely enclosed rodeo arena seating more than 18,000 spectators. Over the next decade, ownership of the arena would change hands three more times. As with a majority of the American populace, Baker was hit hard financially by the Great Depression of 1929 and was forced to sell the stadium to cowboy actor Hoot Gibson in 1930. Gibson continued to hold rodeos at the stadium and drew a Hollywood crowd including famous actors such as William S. Hart, Harey Carey, Tom Mix, and John Wayne. He also used the stadium as a movie set or leased it to other companies for film making. In 1934, Gibson sold the stadium to Paul Hill, owner of the Western Livestock Stockyards. As with Baker, the stadium brought Hill financial hardship when it was hit by the great flood of 1937. Heavy rains that year caused a river of water to flow down Soledad Canyon and filled the stadium with debris. Hill was unable to afford the cleanup, and the stadium was repossessed by the bank. Ownership of the stadium passed to William Bonelli in 1938 and was renamed Bonelli Stadium. Bonelli continued the tradition of rodeos for a number of years but ultimately turned the stadium into an auto race track. Auto racing debuted on a part-time basis in 1939.